The budget airline is postponing its initial five deliveries of the MAX 7 by two years to 2021, casting a cloud over the jet’s scheduled debut later this year. 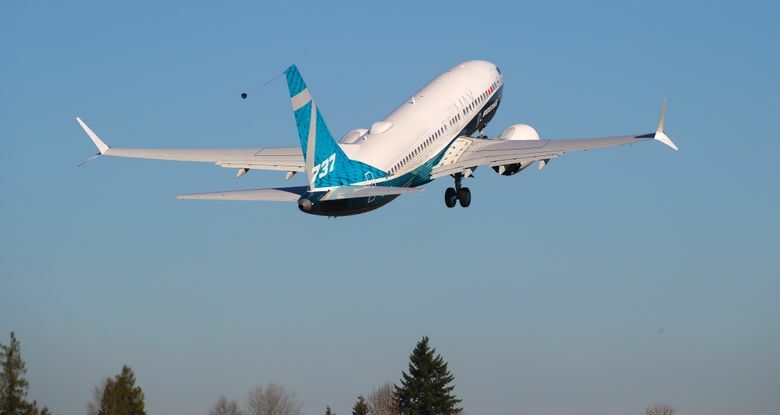 WestJet Airlines is outgrowing its crush on Boeing’s MAX 7 jet, adding to concerns about the future of the smallest member of the 737 MAX family. The Canadian carrier is switching its focus — and perhaps some of its orders — to larger, more fuel-efficient versions of the plane that fit better with its cost-cutting goals, Chief Executive Officer Ed Sims said Wednesday. WestJet’s shift would endanger Boeing’s backlog of orders for the MAX 7 as other carriers veer toward bigger siblings such as the MAX 8 and 10. WestJet and Dallas-based Southwest Airlines are the main customers for the variant, which is the slowest-selling of Boeing’s upgraded 737 jets. Southwest has ordered 30 MAX 7s, and 219 of the MAX 8. Just a year ago, WestJet was planning to operate five MAX 7 aircraft in 2019 and envisioned the aircraft as a key component of its fleet. “We love those planes,” said former CEO Gregg Saretsky, who was replaced by Sims in March amid rancorous labor talks. According to a filing this week, WestJet’s fleet in 2027 is still scheduled to include 22 MAX 7s, along with 20 MAX 8s and 12 MAX 10s. But some of the planned MAX 7 deliveries might be converted into MAX 8 and MAX 10 orders in the next three years, Sims said. Competition in the narrowbody segment is fierce. Airbus’ A220 and new models from Brazil’s Embraer are jockeying for sales in the same sliver of the market as the MAX 7: jets that seat between 130 and 150 travelers. The MAX 8 seats as many as 178 passengers in a dual-class cabin, with the MAX 10 carrying up to 204. Sims is counting on the larger variants of the 737 to reduce fuel consumption and help WestJet in its push to achieve annual savings of as much as C$200 million ($151 million) by 2020. The CEO sees additional efficiencies from the deployment of 10 Boeing 787 Dreamliners as WestJet expands long-distance service and introduces a business class cabin. The carrier is scheduled to start Dreamliner service between Toronto and Calgary Feb. 20. Trans-Atlantic operations with the new jet will begin in April. WestJet will consider exercising options to purchase 10 additional Dreamliners over the next few years, Sims said. Option conversions will be evaluated at six-month intervals as the carrier gains a better understanding of the advanced widebody plane, he said.